The Election Is a Month Away. F*cking. Vote. "Y'all tellin me that I need to get out and vote, huh. Why? Ain't nobody black runnin but crackers, so, why I got to register? I'm thinkin of better sh*t to do with my time." ~ Andre 3000, "Git Up, Git Out"
It wasn't even 100 years ago when women couldn't vote in this country. It wasn't even 50 years ago when black citizens were taxed and otherwise discriminated against, just to have their vote. And today, the current efforts underway to disenfranchise certain demographics of voters is more proof than ever that our votes are the only thing that can upset the oligarchy's dominance over our country, and that those oligarchs will do everything they can to stop us from voting. 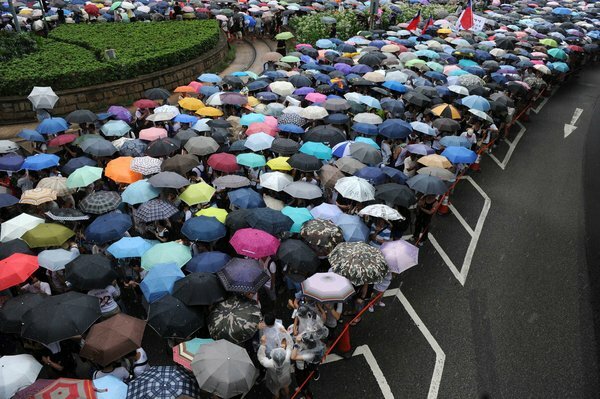 If tens of thousands of people in Hong Kong are braving pepper spray, tear gas, batons, and mass arrests, and are even willing to take over a major highway, sleep on it overnight, and refuse to leave in the middle of a tropical downpour just for the right to have free and fair elections, then we have no excuse here to not participate in our elections. As soon as the Supreme Court returned to work this week, the first thing they did was uphold a Republican plan to restrict early voting in Ohio, one of the most politically significant states in presidential elections. North Carolina Republicans are going above and beyond to make it difficult to vote. Along with cutting early voting days, restricting voter registration drives, and implementing strict voter ID laws, they've passed a law allowing ballots to be thrown out for voters who accidentally showed up at the wrong precinct, even if they're voting for candidates not specific to that precinct. Wisconsin's voter ID law is so stringent that an 87-year-old woman who has participated in every previous election now has to prove to election authorities that she isn't an undocumented immigrant. All of these Republican attempts to disenfranchise voters are being justified as preventing the mythical "voter fraud." However, when one Loyola Law School professor investigated actual instances of voter fraud, he discovered only 31 cases out of over 1 billion ballots cast. Isn't it funny that Republicans don't want to change existing gun laws despite American gun deaths being on track to outnumber traffic fatalities next year, yet they're doing everything they can to make it harder to vote despite the specter of "voter fraud" proving virtually nonexistent? Republicans know their policies are unpopular, and 72 percent of Americans disagree with their policies. Their strategy to win control of the Senate, and by default, control of the entire legislative branch of our government, is to prevent as many people as possible from voting. This further proves that our votes matter, that having poor people and people of color vote scares the sh*t out of bad politicians, and that every vote counts. Too many people think that by not voting, they're making a political statement that they have no confidence in our current political system. But in reality, not showing up to vote is making a de facto political statement that they accept the status quo and see no reason to show up to change it. In contrast, by showing up to vote, you're making the statement that as a citizen, you're paying attention to what people being paid with your tax dollars to make decisions on your behalf are doing. And if they aren't representing your interests with your votes, you're exercising your right to fire them. When you have the opportunity to cast your ballot and don't, you're letting corrupt, ineffective elected officials know that things in your life are good enough that you'll let them keep their jobs. When Elizabeth Warren introduced a bill that would lower student loan interest rates to 0.75 percent, the same rate offered to big banks for borrowing billions of dollars, Republicans in the Senate filibustered it. When a bill that would have increased the minimum wage from $7.25 an hour was introduced, Senate Republicans filibustered it, and House Republicans unanimously opposed the companion wage increase bill. When a bill that would have revoked tax breaks for companies that ship American jobs overseas was under consideration, Republicans blocked the bill from even being debated. Even bills that would have provided job training, increased access to healthcare, and higher education for veterans were filibustered by the Republican minority in the Senate. A month from now, we have the opportunity to say who should serve in 33 U.S. Senate seats. And if you're at all upset about the status quo of Republican filibusters of common-sense bills in the Senate, you need to do everything in your power to stop them from controlling that chamber. There isn't one average American citizen anywhere who loves a gridlocked legislative body that's unable to accomplish even the most basic tasks. If you care at all about ending such unprecedented obstruction, you need to vote this November. One major argument from non-voters is that nobody on the ballot adequately represents their views and interests, so why bother? But this is precisely the reason why voting in every election is so important. By voting in summer primaries, you're deciding who should have the right to appear on the ballot in the fall. Those primary candidates often get their start in local, county, and state elected offices, and you have the power to cast a ballot in all of those elections as well. If you don't like either candidate on the November ballot, ask yourself if you voted in the primary. If you don't like any of the candidates on the ballot in the primary, ask yourself if you voted in the last local/county/state election cycle. If you didn't like any of those local candidates, then try running for one of those local offices yourself! Even a no-vote in a local election can cause plenty of havoc. One great example is what's happening in a suburb of Denver, Colorado. Julie Williams, an ultra-conservative member of the local school board, is forcing curriculum onto high school students that whitewashes American history in a way that promotes the acceptance of authority and discourages civil disobedience. This means those students will be historically illiterate when it comes to the civil rights movement that won black Americans the right to be afforded the same services as whites, to the women's suffrage movement that won a constitutional amendment guaranteeing women the right to vote, and to the labor rights movement that guaranteed an 8-hour work day and a five-day work week, abolished child labor, and established basic rights like a living wage and a safe work environment. Ironically, those students last week held a mass walkout in protest of the new curriculum, and this week, their teachers joined them by calling in sick to join the protesting students. If enough of those students and teachers vote in the next school board election, they can oust Julie Williams and put in someone who promises not to force ideology down the throats of impressionable young students. Direct action is necessary, but without the vote, the protests are ineffective. For another consequence of not voting, look to Ferguson, Missouri. Fifty of the city's 53 police officers are white, and five of the six Ferguson city council members are white, despite Ferguson's being 70 percent black. The mayor of Ferguson is a white Republican. All Ferguson's black community has to do is vote out the current crop of elected officials, who are doing a poor job of representing them. Sadly, only 6 percent of the black community bothered to show up in Ferguson's last municipal elections. To be fair, Ferguson purposefully holds their city elections in April of odd-numbered years, hence the low turnout. But this could be fixed by a campaign to get the next secretary of state for Missouri to force Ferguson to hold their elections in November of even-numbered years, when voters are likely to show up. My anarchist friends love to quote Emma Goldman, who said, "If voting changed anything, it would be illegal." But those people forget that throughout time, allowing people to vote was considered ill-informed and dangerous, as some political leaders asserted they had authority to rule due to the circumstances of their birth, or by divine right.